Leshan Giant Buddha, the largest stone sculpture of Buddha in the world, sits at the confluence of the Minjiang, Dadu and Qingyi rivers. According to records, the carving of this giant Buddha ( on Lingyun Hill ) was begun in the in the first year of the reign of the Tang Emperor Tang Xuanzong (713 AD), and completed in the 19th year of Emperor Dezong (803 AD), a total of 90 years. 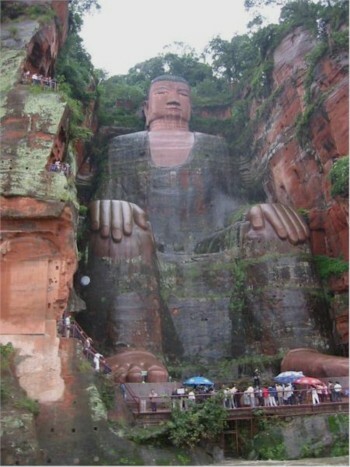 The solemn Buddha is 71 meters high and its head itself is 14.7 meters high. Its ear is 6.2 meters long, eye 3.3 meters wide, and shoulder 34 meters wide. Its head is covered with 1,021 chignons. Its middle finger is 8.3 meters long, and each of the feet are 11 meters long and 8.5 meters wide, large enough to accommodate more than 100 people sitting on it. The huge figure sits with his hands resting on his knees, his head reaching the hilltop and his feet the river, occupying the entire hillside.